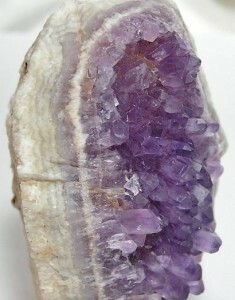 Amethyst is the most highly valued form of quartz. Its distinctive colour, ranging from pale lavender to deep, rich violet, and its delicate crystal structure make it extremely popular. Throughout history, it’s been mentioned in the myths, legends and beliefs of many diverse cultures. Its name is taken from the Greek word amethystos, meaning “not intoxicated”, since it was believed amethyst could prevent the inebriating effects produced by Dionysus (also called Bacchus), the god of wine and the grape, thus keeping the wearer clear-headed and quick-witted. For this reason, the Greeks carved drinking vessels from amethyst, or decorated them with it. In a myth created by the French, Dionysus falls in love with a young maiden named Amethyste, and pursues her. Amethyste doesn’t feel similarly about Dionysus and asks the goddess Diana for help. Diana responds by changing Amethyste into a statue of pure, crystalline quartz. A saddened Dionysus weeps tears of red wine over the loss of his beloved, which stains the quartz violet, thus creating a new gemstone. Amethyst has also been considered a symbol of humility and moderation, since violet is a colour in which the fiery, passionate blaze of red is softened, and the ancient Egyptians would place it around their children’s necks to make them well-behaved and obedient. It’s been used for thousands of years in magic, healing and psychic empowerment. People have worn amethyst to prevent enchantment, or placed it under pillows to encourage pleasant or even prophetic dreams and to strengthen the memory. It’s believed to calm the emotions and reduce stress, transmit the healing power of the universe, increase psychic awareness, or enhance the affection of one’s lover. On the utilitarian side, it’s been engraved into cameo style images, which were often attached to a ring and used to produce a wax seal. Amethyst is found widely, particularly in Brazil and Uruguay, but also in Russia, Austria, South Korea, India, Zambia, the United States and Canada. Although quite a hard stone, care should be taken to protect it from heat and excessive sunlight as this may cause the stone to lose some colour. Clean it with warm, soapy water and a soft brush or an ultrasonic cleaner.